Alanna Mitchell | Award-winning Canadian science journalist. Did you know that our planet is a big, spinning magnet? Or that it is constantly making and remaking its own magnetic field? Or that, right now, there is a titanic battle going on inside the Earth’s molten core as different magnetic factions wage war against each other, striving for dominance? It’s true. Not only that, but this intimate internal battle is gaining strength and these rearguard cabals are trying to topple the system we have now. When they succeed, the Earth’s two normal magnetic poles – north and south – begin the long trek to switch places. North becomes south. South becomes north. In physics-speak, the planet’s magnetic field changes direction. The process can take as much as thousands of years. And during that time, the magnetic field wastes away to about a tenth of its usual force, exposing everything on the planet to dangerous solar and cosmic rays. That could scotch the electromagnetic structure of civilization, putting us back into the equivalent of the Victorian era, technologically speaking. Creatures on Earth will be exposed to more UV radiation and their ability to navigate to find food and mates could be impaired, even highly endangered ones like sea turtles and whales. Yet hardly anyone on Earth knows that this is afoot. That’s why I wrote my new book The Spinning Magnet. It tracks the story of how we know all this, including the fantastic findings of the 20th century that proved that the Earth’s magnetic poles have switched places many times and the up-to-the-minute analysis that tells us that our planet’s molten core is in such turmoil right now that the poles may be forced to change places once more. It’s been breathtaking to research and write. And so far, it’s getting some wonderful advance praise. 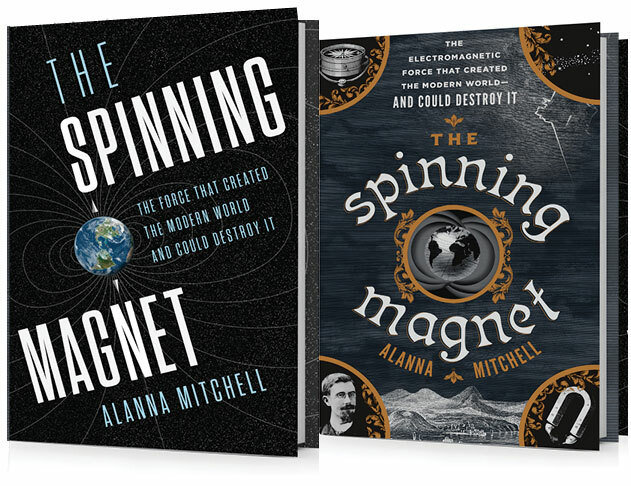 Just finished,your excellent book The Spinning Magnet. Well done. Informative and entertaining. Hats off! THANK YOU for your book. Just found on the shelves in Austin, Tx. brain and energy managed by remote ?) and “Direct Communication”-beyond the ears and well into the “Patent of God”.. .does this come from the “lines”, r cell towers…or GPS-the “Frequency Hopping ” patent from early 40’s? There are incredible moments of “Optimum Healing”, Molecular awareness of how thought works, personality enrichment and other teachings. However; the mental war/terrorism that has been working with the “Omnicide Level” “Life3.0” book discusses….it really exist. Are the lines -the physics or tools used…or that which is natural? I’m a journalist at the Toronto Observer. I’m doing a class where I’m teaching students how to interview scientists. I’m covering the do’s, the don’ts, and what the media may miss. I’m hoping I could speak to you over the phone. I wouldn’t need more than 15 minutes of his time. I’d like to hear about his experiences with media and any insight he could provide. My deadline is next Tuesday. I’m a producer for WGN Radio in Chicago. My station broadcasts 38 states and part of Canada. I was wondering if you would be interested in joining our talk show Sat morning (2-5am my time) to talk about thr changing if the poles, Spinning Magnet. My host is fascinated with it and we’ve been looking for a great interview. I know it’s early, but I do podcast after the show so I can send you a link to listen. We feel live interviews are better, and my host has a decent following. Please let me know if you’re interested, or if we could work something out! I just read your article about Earth’s impending magnetic field reversal. I’m most concerned about my toilet being impossible to flush, as you state. Can you give me tips on how to fix this? Do I need a bigger magnet for my toilet? Hopefully President Trump will stop the magnetic field from reversing. Keep up the great journalism! Just wanted your say that your show in Sydney was terrific and brave. I suggest people be encouraged to join with other people, maybe join Friends of the Earth, or maybe the Greens, or (like me) Socialist Alliance, and not to be left alone feeling inadequate with the invaluable information you gave us. People have to connect, not feel isolated, and take action. I am putting all my Canadian relatives onto you. Well done, what you are doing. You would find a friendly ally in my relative, Freda Guttman in Montreal, I think.